President Emmerson Mnangagwa (right) speaks to his South African counterpart, President Cyril Ramaphosa, during the just-ended Third Session of the Zimbabwe-South Africa Bi-National Commission meeting in Harare. Captains of industry and commerce yesterday expressed confidence that the Bi-National Commission (BNC) meetings held between Zimbabwe and South Africa this week will promote trade and economic cooperation between the two countries. Confederation of Zimbabwe Industries (CZI) president Mr Sifelani Jabangwe said the fact that South Africa was the largest economy in Africa and Zimbabwe's biggest trading partner, Harare stood to benefit from closer cooperation. 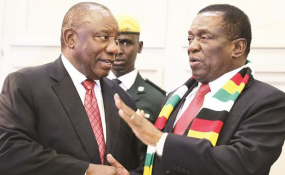 President Cyril Ramaphosa yesterday said Pretoria's exports to Zimbabwe topped 30 billion rand in 2018, making Harare a critical trading partner in Africa. "We are still waiting for the finer details of the BNC discussions and (possibly a) communiqué, but for us, just closer cooperation between Zimbabwe and South Africa is positive as we need to develop together," said Mr Jabangwe. In 2016, 41 percent of all imports into Zimbabwe were sourced from South Africa and 79 percent of all Zimbabwean exports were destined for South Africa. Mr Jabangwe said the coming together of the leadership at the highest level was critical for stronger economic cooperation. He said the fact that South Africa was closer home provided good reason for Zimbabwe to seek opportunities for closer trade and economic cooperation. "So if we are to develop, it is through partnerships. So, some of the things we must do together, we hope to extend their reach, while at the same time having access to their markets," Mr Jabangwe said. He said it was critical for Zimbabwe to have greater access to South Africa's markets, instead of Pretoria enjoying significant market access in Zimbabwe. "For instance, if we stand together and strategise around platinum between the two of us, we have got over three quarters of the platinum production globally. "If we stand together as well on ferrochrome, we become a much bigger ferro-chrome production bloc. Similarly, on other products South Africa is producing, if we develop those capabilities in Zimbabwe as well, we become a stronger block. "So, instead of strategising individually, they can do it as partners," Mr Jabangwe said. Mr Jabangwe said a common understanding with South Africa on the justification for the restrictions imposed by Zimbabwe on some South African imports was critical. Zimbabwe National Chamber of Commerce (ZNCC) chief executive officer Mr Chris Mugaga said Zimbabwe should, however, move swiftly, as exhorted by President Ramaphosa and ratify the African Continental Free Trade Area (ACFTA). "Secondly, they need to revive the issue of Bilateral Trade Promotion and Protection Agreements (BIPPAs). "It will benefit Zimbabwe more now without the indigenisation policy. They must revive it (BIPPAs) and it should be strengthened. "Thirdly, South Africa should help Zimbabwe in building trans-boundary refineries. "Here we have so many minerals we export in raw form to South Africa. "Most of our exports to South Africa right now are raw materials. Through the BNC discussions, there must be an agreement for beneficiation," Mr Mugaga said. "Focus should be on investment transactions or deals that create more long-term jobs, while at the same time increasing exports or reducing our reliance on imports to stabilise the economy," chipped in Harare economist, Mr Brains Muchemwa.